Protecting pond fish from extreme heat is very important during the summer months. Heat waves can be hazardous to ponds because they cause increased evaporation and photosynthesis which is undesirable to many species of fish. One method of protecting fish from excessive heat is pond aeration. It is used primarily to stabilize the temperature of the water. Aeration works by using flowing water which is cooler on top of the pond’s surface, and will typically incorporate an air compressor and air diffuser. With aeration oxygen levels which are dissolved will increase which will allow the fish to remain healthy regardless of temperature spikes. When buying a kit for pond aeration, you should look for brands which emphasize performance and quality. During periods of extreme heat they will offer the essential oxygen which is needed by the pond and fish within it. They are also useful during winter as they will create a hole in the frozen pond surface which will allow for the escape of gases which are toxic, while simultaneously providing oxygen to the fish beneath. You will want to make sure the aeration kit you buy is suitable for the size of your pond. Small kits are optimal for ponds with 1500 gallons, but for medium or large ponds you will want a kit that can handle at least 4,000 gallons. Another method of protecting your fish from heat is to change 10 percent of the water. This should be done once a day as it will bring balance while lowering the water temperature. The best way to avoid rapid temperature drops is to make sure the water is added within ten degrees of the current pond temperature. You can also use a pond de-chlorinator to condition the water when you change it. During summer you will normally want to feed your fish generously, in preparation for fall and winter when feeding will be reduced and halted. However, when heat waves occur you will want to lower the amount of high protein you give to your fish. The reason for this is because they will have plenty of algae (resulting from the heat wave) which they can feast on and this will be easier for them to digest while producing reduced waste. You should also place a greater emphasis on treating the water. Beneficial bacteria are helpful during heat waves as it will lower the risk of the oxygen being depleted. 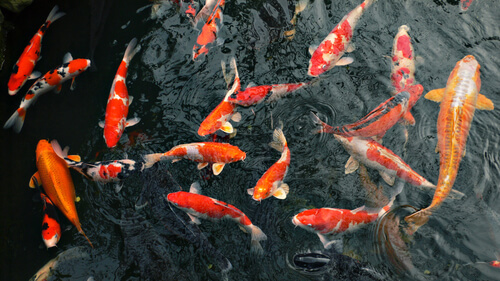 Look for products which will allow the pond to regularly maintain pristine water levels, even when you are not present. Maintaining optimal water levels will protect the filtration, the fish and the pumps. Lowering the amount of sunlight that reaches the pond water will prevent algae from growing and spreading, which will make your pond greenish and swamp like. Some methods for doing this include pond netting or a pond dye. While a degree of sunlight is important, you want to reduce the effects of photosynthesis as much as possible.